Click here for the rest of the statement. This entry was posted in gender equity, IWW, Liverpool on September 24, 2014 by adamford145. 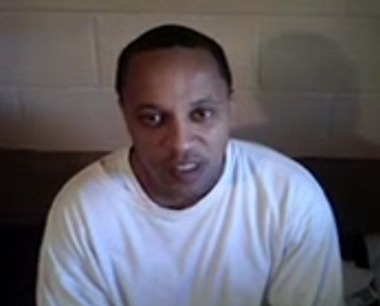 Prisoners in Alabama have started to organise as workers, in conjunction with the Industrial Workers of the World (IWW). The group of hundreds of inmates, called the Free Alabama Movement, approached the IWW some months ago in order to held them organise and get the word out about their struggle. “This is the second peaceful and nonviolent protest initiated by the brave men and women of the Free Alabama Movement (F.A.M.) this year building on the recent Hunger Strikes in Pelican Bay and the Georgia Prison Strike in 2010. They aim to build a mass movement inside and outside of prisons to earn their freedom, and end the racist, capitalist system of mass incarceration called The New Jim Crow by Michelle Alexander and others. The Free Alabama Movement is waging a non-violent and peaceful protest for their civil, economic, and human rights. “The conditions in Alabama prisons are horrendous, packing twice as many people as the 16,000 that can be housed “humanely”, with everything from black mold, brown water, cancer causing foods, insect infestations, and general disrepair. They are also run by free, slave labor, with 10,000 incarcerated people working to maintain the prisons daily, adding up to $600,000 dollars a day, or $219,000,000 a year of slave labor if inmates were paid federal minimum wage, with tens of thousands more receiving pennies a day making products for the state or private corporations. “In response, the Free Alabama Movement is pushing a comprehensive “Freedom Bill” (Alabama’s Education, Rehabilitation, and Re-entry Preparedness Bill) designed to end these horrors and create a much reduced correctional system actually intended to achieve rehabilitation and a secure, just, anti-racist society. “While unique in some ways, the struggle of these brave human beings is the same as the millions of black, brown, and working class men, women, and youth struggling to survive a system they are not meant to succeed within. We advance their struggle by building our own, and working together for an end to this “system that crushes people and penalizes them for not being able to stand the weight”. Create a Incarcerated Workers Solidarity Committee in their area. Amplify the voices of incarcerated workers by posting this and future updates to websites, Facebook, email lists etc. People can also copy and paste or adapt this email for the Alabama Department of Corrections. This entry was posted in IWW, prison on April 24, 2014 by adamford145. We are aware that not everyone in the local left will welcome the new arrival. Some will be threatened by our emphasis on democratically-determined struggle and combative tactics. So be it. The working class is taking a hammering, and it is way past time to fight back. We can’t allow ourselves to be divided by those who insist on the tried, tested, and failing ways of doing things any longer. Call yourself an anarchist, communist, socialist or just a trade unionist – it doesn’t matter to us. We will welcome you if you’re looking to organise on a horizontal basis – i.e. no bosses – to defend ourselves against the attacks of the boss class, and even start pushing them back. With our vastly superior numbers, this is very achievable, though the established left never seems to get it right. But we can. Liverpool and the wider region is crying out for an organisation prepared to give words like ‘solidarity’ and ‘comradeship’ their full meaning, instead of the ritualised, hollow jumbles of letters they have become. We send greetings to our fellow wobblies around the world, but far more than that, to local people working private sector or outsourced public sector, performing ‘unskilled’ labour, doing internships or ‘apprenticeships’ at a ridiculous wage, moving job to job, working two or more zero hour jobs, on workfare, and/or suffering long periods of unemployment. Those people – including some of us Liverpool wobblies – have been the least likely to organise at work, even though we may have the least to lose. And we are the people who need to most, who can set an example to the rest of the class. Join us on Facebook, Twitter, or in real life. This entry was posted in IWW, Liverpool on March 22, 2014 by adamford145. Boston IWW Need Your Help! 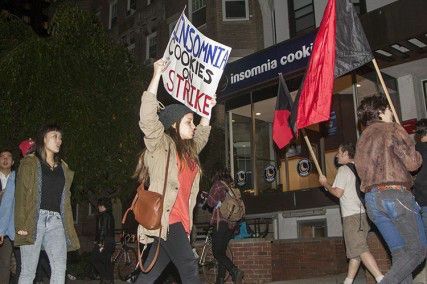 Insomnia Cookies has suspended IWW Organizer Tasia Edmonds w/o pay for a month, falsely claiming she was “unprofessional” and neglected to serve her any formal written notice. You’re invited to take action against union-busting by the boutique cookie business. Join IWW and our allies as we picket in support of Tasia! Background: Tasia went public with her union affiliation on December 7. She has been building the union in her store.In February, a new manager began harassing her about her union membership. On March 9, Tasia was told she has been suspended without pay for a month! The union is filing Unfair Labor Practice charges with the National Labor Relations Board (NLRB). An organizing drive began at Insomnia in August after 4 workers spontaneously went on strike. Their demands included $15/hr, health care, and a union, and they were immediately fired. Despite recently promising to give about $4,000 in back pay to the strikers, and post a notice in the store pledging not to retaliate against workers for union activity, Insomnia is apparently still determined to crush the union drive. The union is even more determined to get justice for Tasia and all workers at Insomnia! 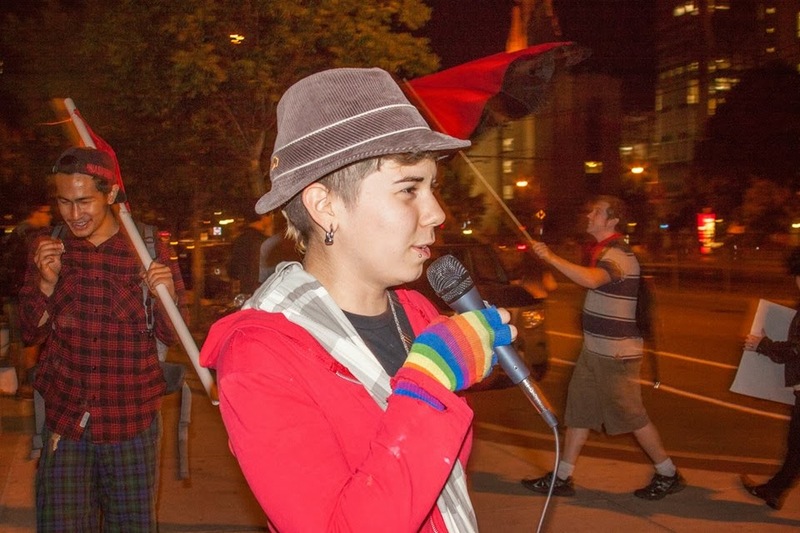 The IWW has set up a solidarity fund, to cover Tasia’s expenses for her month’s suspension. This entry was posted in IWW on March 13, 2014 by adamford145. Four workers at Insomnia Cookies’ Cambridge store went on strike on August 19, protesting poverty pay and wretched working conditions, and demanding $15/hr, health benefits and a union at their workplace. The company illegally fired all four. For the next six months strikers, IWW members, allies, and student organizations at both Harvard and Boston University held pickets, marches, rallies, forums, phone blitzes, and organized boycotts, while workers continued organizing at both the Cambridge and Boston locations. The union also pursued legal charges through the National Labor Relations Board (NLRB). On March 3, a company representative signed an agreement promising almost $4,000 in back pay to the four strikers (two of whom had given notice before going on strike; and all of whom had moved on to more rewarding jobs or pursuits). The company also agreed to post a notice in the Cambridge store, promising not to fire or otherwise retaliate against workers for taking collective action, including joining the union and going on strike. The company was also made to revise a confidentiality agreement that improperly restricted workers’ rights to discuss their conditions of employment with one another and third parties (including union organizers and the media). All references to the terminations have been removed from strikers’ personnel files. This entry was posted in IWW on March 5, 2014 by adamford145. This is the second post in a series setting out my perspective on the development of a new working class movement in the UK and worldwide. The first part focused on community organisation, while future blogs will look at how we can beat the cuts locally and nationally, the importance of intersectionality to class struggle, the place of the UK working class in the world struggle, creating a new world, full socialism, and full communism. In general, union organising in the UK is at a dire low ebb. In the face of a ruling class onslaught unprecedented within living memory, workers are offering little to no organised resistance. Despite cuts across the public sector, and ever increasing pressure in the private sector, the number of strike days ‘lost’ to employers in 2012 (the last year for which records are available) was 248,000 – the lowest level since 2005, during the pre-credit crunch ‘golden years’. Over the five years of the ‘great recession’, they have been kept down to a historically low 600,000 per annum. Strike days aren’t a complete measure of resistance levels, but they do show that the prevailing trend is downward. Government, corporate bosses and trade union leaders must be quietly congratulating themselves that they appear to have managed mass ‘great recession’ anger so well. But that isn’t the full story. Due to Thatcher’s anti-trade union attacks, the suppression of class struggle during the Blair/Brown years, and the wholesale restructuring of the UK economy, an entire generation – or perhaps even two – has come to maturity with no example of workplace organising at all to follow. Union membership is down from half the working population in 1979 to 26% today. Within union membership, there has been an increase in the percentage of people in ‘professional’ or associated occupations, and these are often highly qualified. The economic crisis has played a large part in this trend. In 2007, there were 982,000 trade unionists in manufacturing and construction; now it is down to 586,000. Many of those jobs don’t exist any more, while others have simply stopped paying their union dues because it doesn’t get them anywhere. Trade unionists are also now relatively old. In 1991, 22% of workers under 24 were in a union. In 2012, this was down to just 4.1%. So there are vast swathes of the working class for whom trade unions simply don’t exist, who have maybe never even heard that they exist. These people are predominantly younger and in precarious (at best) employment. These are the people who are private sector or outsourced public sector, performing ‘unskilled’ labour, doing internships or ‘apprenticeships’ at a ridiculous wage, moving job to job, working two or more zero hour jobs, on workfare, and/or suffering long periods of unemployment. They are currently the least likely to organise at work – even though they have the least to lose. And they are the people who most need to, who can set an example to the rest of the class. I therefore believe an organisation in the tradition of the IWW is the best way of organising workers in this hyper-globalised, hyper-competitive world. It may not be the IWW itself. Two and a half years on from Occupy, a movement could spring up any day and spread memetically via Twitter and Facebook in hours. But it should be organised along the same lines as the IWW. The recent and ongoing success of the IWGB (an IWW breakaway)’s ‘3 Cosas‘ campaign shows what can be achieved when workers are in control of their own struggles. One of the best things about 3 Cosas has been its success in uniting London radicals of all historical ideologies and none behind real, horizontally-organised working class fightback. Unlike its anarcho-syndicalist counterpart SolFed, the IWW model (and indeed the IWGB’s) is a space where working class people can organise themselves regardless of political affiliation, without worrying too much for now – when we’re at such a low level – about which past failed revolution we want to emulate most. 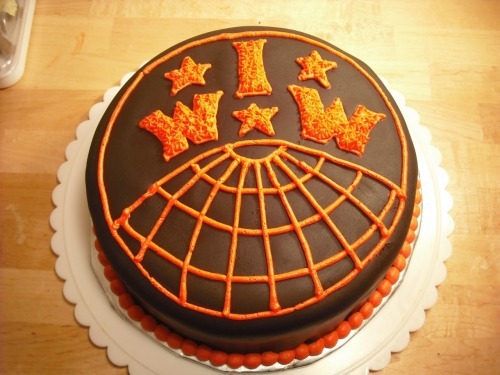 Due to the rank and file control, plus the aim of creating ‘one big union’ regardless of profession, the IWW model has the potential to reach out beyond the walls of whatever workplace, and out into communities. This can win the vital support of customers in the private sector, and service users in the public sector. This second combination will be necessary to stop future national and local government cuts, and that will be the topic of part three in this series. This entry was posted in IWW, new working class movement, union on January 25, 2014 by adamford145. Workers at the Amy’s Bread bakery in New York have gone public about their organising, following a march on Monday. They have demanded a living wage, affordable healthcare and respect at work, but they are fighting for these demands outside of traditional union structures. Rather than seek union recognition, they are aiming to embarrass their employers into accepting their demands using the power of the internet. Amy’s Bread sell high quality organic “artisanal” baked goods for high prices, and the outlet is known to be a favourite of celebrities such as Megan Fox, Jesse Eisenberg, Meg Ryan and Whoopi Goldberg. But the people who make and prepare those goods don’t take home enough pay to make ends meet, and nurse injuries caused by the company’s lack of investment in their protection. Ana Rico, an overnight cleaning worker at Amy’s, has described how she’s “in pain all the time”, thanks to the company’s months-long failure to replace a machine for washing trays. Since the old machine broke down, she has scrubbed two hundred trays per night, in “really hot water”, alongside vacuuming and general cleaning duties. Unpaid overtime is common. Then “Every time that I get home, I have to take pills and use creams”. On top of this, she can’t afford proper medical treatment for the working injuries, because the company’s insurance policy would cost “about half of my [pay] check”. ‘Obamacare’ has clearly done nothing to help the likes of Ana. The campaign is being organised by the affected workers themselves, in conjunction with an advocacy group called Brandworkers. Founded in 2007 by Industrial Workers of the World member Daniel Gross, the New York-based movement aims to train food production workers in the use of social media and other tools to embarrass employers into compliance with the law and improvement of working conditions. To that end, the amysbread.brandworkers.org website is asking people to read personal quotes of publicly named Amy’s Bread workers, sign up to support their campaign, and their story on Facebook/Twitter using #WhoMakesAmysBread. This entry was posted in internet, IWW, New York, USA on November 26, 2013 by adamford145.